A few years ago, I spent a weekend in Hibbing, Minnesota, Bob Dylan’s hometown. I saw Howard Street and Dylan’s monumental high school and, weirdly enough, the rope swing he sat on as he serenaded his girl Echo. But as it turned out, I spent the majority of my waking hours in Hibbing at a bar called Zimmy’s, an old trolley-car station where the brick interior was covered with all things Dylan: guitars and photos, the sign from a movie theater Dylan’s relatives owned, a window from the bedroom of his childhood home, a street sign Bob Zimmerman would have seen looking through the window pane. This week, I was plotting a return to Hibbing when I learned something that caught me off-guard: Zimmy’s may not be there when I get back. In November, the owners ran into financial trouble. They lost their liquor license in February and now face a six-figure tax bill they cannot come close to paying. They closed the doors last night. 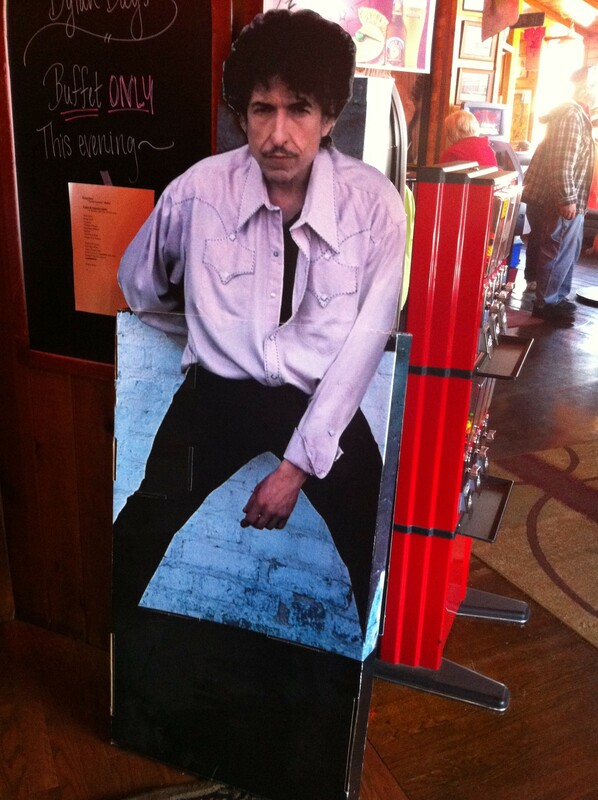 Before I made it up to Minnesota, a Bob Dylan Bar & Grill sounded like a guaranteed train wreck of an establishment. There could be no way to pull it off without it devolving into incurable tackiness. I gasped when I looked at the menu online: Zimmy’s sold a “Simple Twist of” Sirloin and a “Slow Train” veggie pizza, for chrissakes. Really, I would rather stab myself in the leg with a fork than say those words in public. Then I arrived, and I hung around, and I met the proprietors, and now three years later I can say that I’m going to be sad to see Zimmy’s go. An exceedingly friendly woman named Linda Stroback ran the operation. Her husband, Bob Hocking, a social worker, was responsible for all the Dylan memorabilia. They’re Dylan fans who met in art school in Montana, and ended up back in Hibbing, where Hocking grew up. The restaurant had been in business before they arrived, but it was Linda who, after working there a while, suggested changing the name. She hoped the Dylan reference would be a hook to keep the place afloat by drawing visitors from outside Hibbing. She and Bob became majority owners of the restaurant in 2000. Linda also pushed to get a stretch of 7th Avenue renamed Bob Dylan Drive, and became a driving force behind Dylan Days, the annual fan fest that drew me and a few hundred other people to the North Country that May. The year I went, there was a dance in the basement of the hockey arena, where the pilgrims tucked into young Bob’s favorite dessert—cherry pie à la mode, or so they assured us. 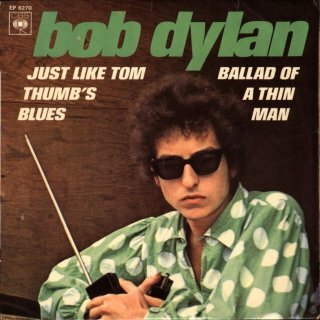 Two Dylan collectors showed up in billowing custom-made polka-dot shirts, a get-up the singer wears on the cover of a rare French single (“Just Like Tom Thumb’s Blues” / “Ballad of a Thin Man”). Providing the music was a guitarist who played with Dylan in high school; he could still bring it. There were readings for winners of the literary contest. There was a tour of Dylan’s Hibbing, which included a look at the railroad crossing where Dylan almost bought it on a motorcycle as a teenager. But Zimmy’s was ground zero. For two nights Dylan fans from the world over got on stage and performed in a singer/songwriter competition. All day the place was packed with the Dylan crowd: Bill Pagel, whose boblinks.com has tracked Dylan’s concert schedule for decades; a few people who went to grammar school with Dylan; a skinny teenager nicknamed “Little Diamonds” who was dressed like Dylan (circa the Rolling Thunder Revue). A bearded academic from Sydney named Mark Sutton brought down the house with his satire, “I’m a Bigger Dylan Fan Than You.” A Canadian who’d had far too much to drink badgered Sutton until he taught him the chords to “Days of ’49,” which he then belted out in front of the bar at 2 a.m. I met a couple of women from Fargo with Milton Glaser’s Dylan tattooed on their ankles. For all the other trappings of the weekend, Dylan Days was really just about hanging around with other Dylan freaks at the bar. I’m told the show will go on in 2014. But it’s still to be determined how they’ll replace that Zimmy’s vibe if the bar doesn’t reopen in time. Linda and Bob are not sure what will happen in bankruptcy court. They’re hoping to save the memorabilia. But the creditors can’t get at their stories. Once, Dylan’s nephews showed up, and Linda tried to ply them with Zimmy’s swag to give to their uncle. They demurred: Bob Dylan doesn’t generally wear Bob Dylan shirts. Another time, Dylan’s mother, Beatty Zimmerman, walked in for lunch. Dylan has not always been well-liked in Hibbing. * He didn’t exactly fit in growing up, and he couldn’t wait to bust out of there. At first, arriving in New York and hitting it big, he would tell people he was from anyplace but Hibbing. It’s changed in recent years, but for a long time fans who visited might get an earful from the local crowd about that no-account Bob Dylan. So when his mother walked in the door that day and looked around, Linda was happy she didn’t raise a ruckus about a couple of Hibbingites trading on his name. UPDATE: Arie de Reus, collector extraordinaire from The Netherlands, sends along the photo of those spectacular shirts.